When most people think about rosemary recipes, roasted meats and vegetables usually come to mind. However, rosemary can be used in wide variety of recipes. As you'll see below, some of our favorite recipes feature rosemary in cookies, refreshing drinks and even bread. In fact, some chefs have even used rosemary to make ice cream. 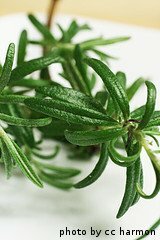 Before we share some of our favorite rosemary recipes, here is some nutrient information. In a large bowl, stir together yeast, warm water and sugar. Let sit about 10 minutes. Stir in flour and salt and mix well. Cover the bowl and let dough rise in a warm area for about 1 hour, or until it doubles in size. Punch dough down, divide into 3 parts and shape loaves into desired shape. Place loaves on a greased baking sheet. Brush melted butter onto the loaves. Sprinkle rosemary onto the tops of the leaves. Loosely cover and let rise about 45 minutes. Bake bread in oven preheated to 350 degrees F. Bake for 45 minutes or until bread is golden brown. In a bowl, mix together olive oil, garlic, rosemary, basil, oregano, salt and pepper. Wash chicken inside and out. Pat dry with paper towels. Slowly loosen the skin from the breast by working your fingers between the breast and skin. Keep going until the skin is loose near the end of the drumstick, being careful not to tear the skin. Using your fingers, spread the rosemary mixture under the skin and onto the meat. Spread it under the skin of the breast, thigh and leg. If there is any rosemary mixture left over, spread it on the outside of the skin over the breast. Cut the onion in quarters and place it inside the cavity of the chicken. Cut the carrots and celery into chunks and place them inside the cavity as well. Cut the lemon in half and place it in the cavity, cut side up. Place the chicken on a rack in a roasting pan. Place the roasting pan in the preheated oven. Pour 2 cups of water into the bottom of the roasting pan. Roast the chicken for 2 hours, or until the internal temperature reaches 170 degrees F. Let rest for 10 minutes before carving. Bring water and sugar to a boil in a small saucepan. Stir in rosemary and remove from heat. Let rosemary steep for at least 2 hours. Place 1 cup of lemon juice and 6 cups watermelon into a blender or food processor. Strain rosemary syrup through a mesh strainer into the blender. Cover and puree until smooth. Strain puree mixture through a mesh strainer into a pitcher. Puree remaining 1 cup lemon juice, 6 cups watermelon and honey in blender. Strain mixture into the pitcher and stir well, combining both strained purees. Serve chilled over ice. To a large bowl, add potatoes, onions, butter, olive oil, rosemary, salt, pepper and garlic powder. Toss until potatoes and onions are well coated. Line a baking sheet with foil and spray it with non-stick cooking spray. Spread potatoes and onions into a single layer on baking sheet. Bake in preheated oven for approximately 40 minutes, or until potatoes are tender. Serve immediately. Rub each fillet with olive oil and season with salt. Place each fillet on the center of one large piece of foil. Sprinkle 1 tablespoon white wine over each fillet. Then top each fillet with slices of lemon and 2 sprigs of rosemary. Fold foil over each fillet, creating 4 packets. Be sure to seal each packet well. Place packets on a baking sheet and place in preheated oven. Bake 20 minutes and remove from oven. Let cool slightly before opening packets. Serve immediately. Beat together butter and sugar in a bowl until creamy. Stir in egg and beat until well combined. Slowly stir in flour, rosemary and baking powder until well blended and a dough forms. Divide dough into 2 equal-sized pieces and shape each piece into a log about 1 1/2" in diameter. Wrap the logs in plastic wrap and refrigerate for at least 3 hours. Cut the logs of dough into thin slices about 1/8" thick. Place them on the prepared baking sheets. Bake in preheated oven about 12 minutes, or until edges turn golden brown. Let cookies cool on baking sheets for 2 minutes before removing them to cooling racks. Store cooled cookies in an airtight container.